NVivo for Mac Beta will be free to download and use until June 2014. It will enable researchers to collect, organize, and analyze content from interviews, focus groups, observations and literature. In June, all K-State users of NVivo for Mac will have to use the professional NVivo for Mac version. Information about access will be available closer to the June release date. 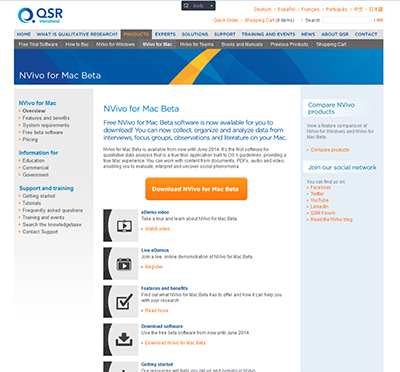 Built to Mac OS X guidelines, NVivo for Mac “has been designed and developed to look, feel and behave as a true Mac application for qualitative data analysis and includes improvements not seen before in any other NVivo release, such as a simplified, integrated query tool,” reads a recent email from QSR International. Users will be able to exchange NVivo projects between NVivo 10 for Windows and NVivo for Mac Beta. While these project file formats for the two platforms are different, users will be able to convert using the free Service Pack 5 update. NVivo for Mac Beta doesn’t contain all the same features as NVivo for Windows, particularly some of the more advanced text analysis tools. The company will add further features over time. More information is available at the official NVivo for Mac site.